Click the button below to add the Hand stitched "LOVE" bookmark handmade in Thailand (blue) to your wish list. We know how hard it is to find ethically produced stationery. We have done the hard work for you. This beautifully hand stitched bookmark is a perfect accessory for your books. 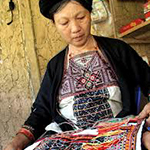 It was handmade by the Hmong women who rely on their exquisite needlework to provide a living for their families. This bookmark is certified Fair Trade, and we hope that it will make a stylish accessory and bring you much joy. For details of our generous shipping and returns policy please click here. Thai Tribal Crafts (TTC), established in 1973, is an agency sponsored by the Christian Service Foundation (Baptist) and registered in Chiang Mai in the name of "Thai Tribal Crafts". The main objective of TTC is to provide opportunities for improving the quality of life of the tribal people in the Northern Thailand. TTC is a certified member of the World Fair Trade Organization.